I am often asked why I belong to many different communities of dancers. The truth is I cannot imagine leaving any of the groups I am affiliated with. My life would not be nearly as rich if I did not have all these dancing friends in my life. I love my clogging teammates. We have been together for a long time (off and on for almost twenty years). We have traveled, competed, and performed as a team. I am beyond fond of the ladies I have danced with at my church, (past and present). And I feel blessed to have danced with hundreds of sacred dancers over the years, from California to Ottawa. I see dance as many things including, but not limited to, physical and mental exercise. So for people who ask me why I love to dance so much, these elements are easily understood. 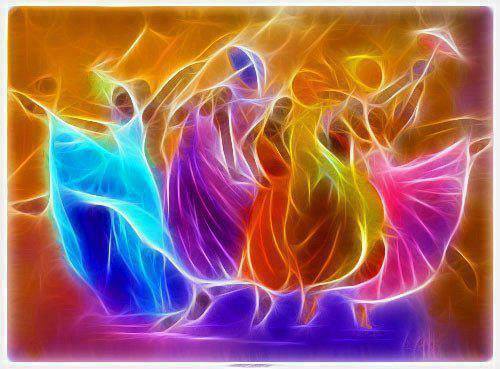 But sometimes it is not as easily understood why I prefer to dance in community with other dancers, especially in the worship experience of sacred dance. Although I have seen, and participated in, solo work as a dancer, I am most fulfilled when entering into the sacred space created with others while moving prayers and worship. I am always keenly aware of the family-like atmosphere permeating the world of sacred dance. But the reason I crave, and am fed by, community has never been clearer to me than when I participated in a one-day event with the National Sacred Dance Guild in Ottawa this past August. We were women and men from two countries, many states and providences, all denominations, all ages, all dance abilities and training, and different ethnicities. How can a short time together create a lasting bond and a longing to be back together at the next SDG festival or event? By all logical laws this would measure as unlikely. But for the sacred dancer, there is a deep spiritual need to express meaning in movement. Along with eagerness to accept one and other, it is not hard to see the formation of a foundation for life-long connection. I cannot say there was one particular dance I enjoyed more than others. But I can say that in a park, on a cloudy Sunday morning in Ottawa, we did a movement piece that brought me into a deeper understanding of why dance within community is vital to the health of my soul. Each dancer was given a long string of clear beads. As the music began, a group of ladies moved with their beads extended over their heads, in front of them, to their side, or dragging on the ground. They danced slowly around the circle at first and then invited others to join. We moved with the beaded strings, independent of one another, for only a short while. Then we each extended one end to another dancer. Through the rest of the piece we moved in, out, and among the newly created formation. We let go of and took up continuing connections with each other. In the middle of the dance my mind registered this profound truth. Here was both a pure definition of community and an explanation for need to be part of one. That is not expressed or understood by words, for me. It is seen by the heart, expressed through the eyes, felt in the touch of another, and fueled by the movement of souls that know, just know, we are all beings who belong to each other. This, my dear dancing and non-dancing friends, is why community. May we move in beauty and connectedness as we celebrate our diversity and embrace our sameness. Thank you so much for linking up with #TheocentricThursdays! I am so excited you have decided to join our growing community. You’ve probably already done this, but I’m dropping in to #TheocentricThursdays participants this week and leaving links to who they are supposed to comment on this week to make sure everyone understands how it works. It works best for the host’s record-keeping if everyone clicks the links on the actual blog hop, but when it comes right down to it, we’re more concerned with everyone receiving at least two comments per week! Entrants are only eligible for featured post status if they follow the rules of reading commenting on the two posts they are assigned. Thank you for reading and commenting. I think in this techno world we are becoming more and more autonomous. There sure are times when it feels good to be on my own but I am community-oriented and try to use and share dance as a way of inviting others in to community as well. Blessings to you today. Mary, thank you. What encouraging words. I thank you for reading and commenting. Blessings.